To Cite: Nahayatbin M, Ghasemi M, Rahimi A, Khademi-Kalantari K, Naimi S, et al. The Effects of Routine Physiotherapy Alone and in Combination with Either Tai Chi or Closed Kinetic Chain Exercises on Knee Osteoarthritis: A Comparative Clinical Trial Study, Iran Red Crescent Med J. 2018 ; 20(4):e62600. doi: 10.5812/ircmj.62600. Background: Osteoarthritis is a common chronic degenerative disorder. Exercise is regarded as a common practice for the elderly, especially those with knee osteoarthritis. Objectives: This study aimed to examine and compare the effects of Tai Chi and closed kinetic chain exercises on patients with knee osteoarthritis. Methods: Forty-eight patients with knee osteoarthritis participated in this clinical trial study, which was carried out in a private clinic (2016) in district thirteen of Tehran, Iran. They were randomly assigned equally to closed kinetic chain exercise (CKCE) group, Tai Chi Exercise (TCE) group, and no exercise group. All three groups were equally treated using a standard physical therapy protocol. The CKCE group performed static stretching and CKCE, and the TCE group performed Tai Chi warm-up and cool-down and the form 6 of Yang style of Tai Chi exercises. All three groups were evaluated at baseline, sixth, and twelfth sessions of treatment and one- month post- treatment using a six-minute walk test and the knee injury and osteoarthritis outcome score (KOOS) questionnaire. Results: According to KOOS subscale, the TCE improved the symptoms (68.94 ± 9.24) (P < 0.001), pain (75.13 ± 12.33) (P < 0.001), ADL (76.50 ± 12.03) (P = 0.01), and the total score (72.12 ± 8.63) (P < 0.001) significantly more than the CKCE (55.50 ± 13.61, 64.75 ± 10.58, 67.25 ± 9.96, 67.25 ± 7.82, respectively) and routine physiotherapy (34.62 ± 11.34, 53.06 ± 9.36, 61.69 ± 10.32, 51.50 ± 7.24, respectively) in patients with knee OA. Both the TCE (376.43 ± 88.18) (P < 0.001) and CKCE (353.50 ± 78.15) (P < 0.001) groups showed improved walking distance significantly more than the no exercise group (315.35 ± 66.33) in patients with knee OA. Conclusions: In patients with knee OA, Tai Chi exercise relieved pain and symptom even in a short time, and improved QOL, sport, and recreational activities, and ADL. The effects of both TCE and CKCE on the improvement of QOL were similar. Osteoarthritis (OA) is a common chronic degenerative disorder, mostly in weight-bearing joints and particularly with the highest rates in the knee joint (1, 2). Since no cure has been suggested for OA so far (3), current conservative treatments, such as physiotherapy therapy, including heat, massage, electrotherapy, and exercise therapy were the most popular treatments (4, 5). Exercise therapy is considered as the keystone of all conservative treatments. Different exercise therapy methods are instructed, such as open kinetic chain exercises (OKCE), closed kinetic chain exercises (CKCE), stretching and Tai Chi exercises (TCE) (3, 6). Several studies reported on the effectiveness of CKCE in increasing the compression forces of joints, dynamic joint stability, and congruity (6). Reports indicate that CKCE causes agonist and antagonist muscles co-contraction and could be applied to daily physical activities (7) and that CKCE are functional, safe, and effective exercises increasing muscle strength and facilitating joint position sense (8). Jan et al. (2009) reported that walking speed and muscle torque had equally significant improvements after CKCE and OKCE, yet knee reposition improvement was greater after CKCE compared to OKCE (9). Tai Chi exercise is a kind of Chinese epic art, which contains gentle joint flexion and extension, circular movement of the limbs, and the movement against resistance and gravity force. It also consists of concentration and respiration techniques mostly in the semi-squat state, which requires joint mobility, stability, and balance (10, 11). Wang et al. (2011) in their study showed that TCE reduced pain and improved physical function, self-efficacy, depression, and health-related quality of life in patients with knee OA (12). Also, Wang et al. (2016) showed that TCE produced more significant improvements in depression and the physical component of quality of life in patients with knee OA compared to patients, who received only routine physiotherapy (13). However, data regarding, which exercise is superior to the other is limited. Considering many reports regarding the benefits of TCE on the physical and social health of elder people, little is known about the therapeutic effects of TCE. It seems that TCE improves pain, balance, and functional ability from several aspects, because of the nature of the TCE exercises and also their effects on both physical and spiritual aspects. However, the literature search did not find any study to compare the TCE with CKCE for the treatment of knee OA. Therefore, it seems necessary to know more about TCE and its effects on knee OA. In the present study, the researchers examined and compared the effects of TCE and CKCE on pain, functional abilities, and quality of life of patients with knee OA. The present study was a clinical trial carried out to examine the effects of TCE and CKCE on the KOOS subscales and functional ability in patients with knee OA. The participants were voluntarily enrolled in the study from patients admitted to a private clinic (2016) in district thirteen in Tehran, Iran with the nonrandom sampling method (convenience sampling). The sample size was calculated using the PASS 11 software, α = 0.05, z1-α/2 was 1.96; β = 0.2, z1-β was 0.84, and power was 0.8. All processes were carried out by one subject. Fifty-three patients with knee OA with an age range of 45 to 65 years were recruited for this study. Inclusion criteria were grades two to three of knee OA based on the Kellgren Larence classification, and at least grade three of muscle strength for lower limb muscles based on the Oxford scale. Patients with either of the following conditions were not included: Malignancy, infection, hyper-mobility, history of knee injury, other musculoskeletal disorders, corticosteroid injections and use of the non-steroidal anti-inflammatory drugs during the last month prior to the study, surgery of the lower limb, under physiotherapy or having attended any fitness classes during the last six months prior to the study. The exclusion criteria were the inability to finish the treatment sessions and an increase in pain intensity during the study. All patients were briefed about the study. Five patients did not participate in treatment sessions. The remaining 48 patients signed a consent form and confirmed a voluntary participation and were assigned randomly using permutation to three equal groups (Figure 1). The study was approved by the local ethics committee of Shahid Beheshti University of Medical Sciences (ethics code: 116/2877, IRCT number: IRCT2014010215936N1). Figure 1. The flow chart of the study (Abbreviations: CKCE, Closed Kinetic Chain Exercise; TCE, Tai Chi Exercise). The demographic characteristics and the Persian version of the Knee injury and osteoarthritis outcome score (KOOS) questionnaire were used for all patients. The validity and reliability of the Persian version of the questionnaire was reported above 0.7 (14). In the KOOS questionnaire, a score of 100 indicated the absence of any problem and a score of zero indicated the worst situation. The KOOS consists of five subscales: Symptoms, pain, activities of daily living, sport and recreation function, and knee-related quality of life. To determine functional ability, all patients also performed a six-minute walk test (15-17). The six-minute walk test ICC was reported as 0.94 (17). The patients were randomly divided to the TCE group, CKCE group and no exercise group, while they were matched in terms of age, gender, degree of knee OA, and Body Mass Index (BMI). The knee OA essential recommendations were given to all patients in the first session. As routine physiotherapy, all patients underwent 15 minutes of infrared and 5 minutes of pulsed ultrasound (EMS Company, UK, intensity= 1 W/cm2, frequency = 1 MHz, duty cycle = 80%). However, the two exercise groups, TCE and CKCE, underwent further physical treatment options. To examine changes in the patients' conditions, all patients filled the KOOS questionnaire and also participated in the six-minute walk test at four intervals: Before the treatment, at the end of the sixth and twelfth sessions of treatment, and one-month post-treatment. Both exercise groups performed 12 sessions of exercises in four weeks as a further treatment option. In the TCE group, the patients were instructed to perform 20 minutes of TCE in each session. The procedure consisted of five minutes of Tai Chi warm-up, ten minutes of exercises according to form six of Yang style in Tai Chi as basic exercises, and five minutes of specific tai chi cool-down exercises. In the CKCE group, the patients were instructed to perform 20 minutes of CKCE in each session including five minutes of static stretching warm-up to minimize the risk of damage, ten minutes of CKCE and five minutes of cool-down exercises. The CKCE consisted of standing terminal extension with ten seconds hold and ten seconds rest, mini squat with an angle of fifteen degrees with ten seconds hold and ten seconds rest, front and side step-up exercises each for ten times and lunge exercise for ten times with ten seconds hold and ten seconds rest. The CKCE were carried out with two-minute rest intervals. The no exercise group had no exercise program during the study. The IBM SPSS Statistics for Windows, version 19.0 (IBM Corp., Armork, N.Y., USA), was used for statistical analysis. Descriptive analysis was used to determine the mean ± standard deviation of variables. With respect to the normality distribution of the data using the Shapiro-Wilk test, two factorial repeated measures Analysis of Variance (ANOVA), with one between-subject factor (group: CKCE, TCE, and no exercise groups) and one within-subject factor (time of measurements: baseline, sixth session, twelfth session, and one-month post-treatment) was used to determine the effects of interventions on the outcome measures (the total and subscale scores of the KOOS and six-minute walk test). The researchers used the total and subscales scores of the KOOS at the first session as a covariate in the analyses; therefore, they could determine only the outcome of the treatment, not the impact of the subscales scores. Significant differences were analyzed using Bonferroni for post-hoc comparison. When there was significant disordinal interaction, the researchers used subgroup analyses. In all tests, the level of significance was considered to be equal or less than 0.05. Forty-eight patients were treated in three groups, including CKCE, TCE, and no exercise groups. The demographic characteristics are presented in Table 1. The ICC for the six-minute walk test showed an excellent repeatability (0.97); and for the Persian version of the KOOS questionnaire, was also found to be good (0.7). Analyses showed significant differences between groups, times of measurements and interaction effect of time* group on the six-minute walk test, and total and subscales scores of the KOOS. The post-hoc results are presented below. Abbreviations: CKCE, Closed Kinetic Chain Exercise; TCE, Tai Chi Exercise. The six-minute walking distance in TCE and CKCE groups was significantly more than the no exercise group (F1,44 = 135.92, P < 0.001, P < 0.001; effect size,0.86). There was no significant difference between TCE and CKCE groups. Six-minute walking distance was significantly different at the times of measurements (F2,88 = 7.18, P = 0.001); the most walking distance was seen in the twelfth session. The ordinal effect of time*group was significant (F4,88 = 32.37, P < 0.001); the most improvement of walking distance was seen in the twelfth session in the CKCE and TCE groups (Table 2). The mean walking distance of the patients increased about 51 meters in the CKCE group, 43 meters in the TCE group and 2.5 meters in no exercise group after twelve sessions of treatment in comparison to the pretreatment walking distance. Abbreviations: CKCE, Closed Kinetic Chain Exercise; F-Up, Follow-Up, One-Month Post-Treatment; TCE, Tai Chi exercise. Symptom subscale score in the TCE group was significantly more than CKCE and no exercise groups (F1,44 = 15.14, P = 0.01, P < 0.001; effect size, 0.81). There was no significant difference between CKCE and no exercise groups (P = 0.053). 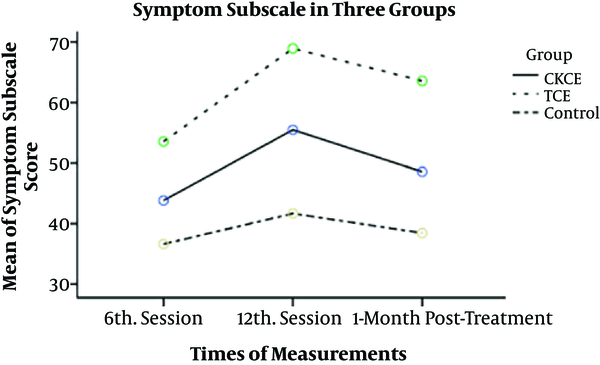 Symptom subscale score at the times of measurements showed significant differences (F2,88 = 165.23, P < 0.001). The greatest improvement was seen during the twelfth session. The interaction effect of time* group was significant (F4,88 = 15.34, P < 0.001). The most improvement was in the TCE group at the sixth, twelfth, and one-month post-treatment (Table 3, Figure 2). Figure 2. The KOOS symptom subscale in 3 groups (n = 48) (Abbreviations: CKCE, Closed Kinetic Chain Exercise; TCE, Tai Chi Exercise). 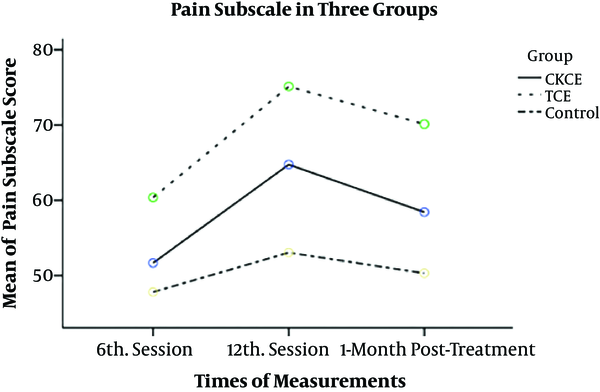 Pain subscale score in the TCE group was significantly more than CKCE and no exercise group (F1,44 = 11.91, P = 0.02, P < 0.001; effect size,0.67). There was no significant difference between CKCE and no exercise groups (P = 0.1). Symptom subscale score at the times of measurements showed a significant difference (F2,88 =272.88, P < 0.001). The greatest improvement was seen at the twelfth session. The interaction effect of time* group was significant (F4,88 = 20.90, P < 0.001). The greatest improvement was in the TCE group at the sixth session, twelfth session, and one-month post-treatment (Table 3, Figure 3). Figure 3. The KOOS pain subscale in 3 groups (n = 48) (Abbreviations: CKCE, Closed Kinetic Chain Exercise; TCE, Tai Chi Exercise). Activity of daily living subscale score in the TCE group was significantly more than CKCE and no exercise groups (F1,44 = 6.11, P = 0.01, P = 0.01; effect size, 0.58). There was no significant difference between CKCE and no exercise groups (P = 1). 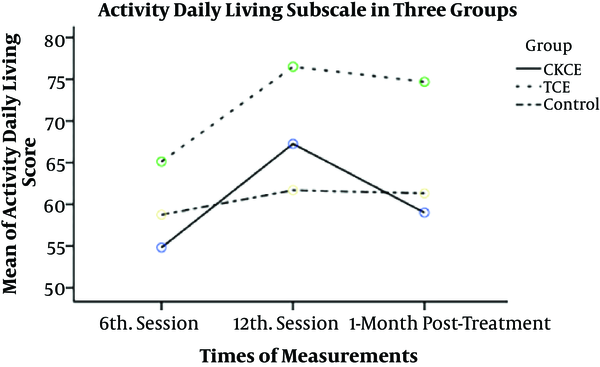 Activity of daily living subscale score at the times of measurements showed significant differences (F2,88 = 154.13, P < 0.001). The most improvement was seen at the twelfth session. The interaction effect of time* group was significant (F4,88 = 24.63, P < 0.001). The greatest improvement was in the TCE group at the sixth session, twelfth session, and one-month post-treatment. There was no significant difference between the CKCE and no exercise groups at the sixth session (P = 0.01) and one-month post-treatment (P = 0.01), while at the twelfth session, the improvement in the CKCE group was more than the no exercise group (P < 0.001) (Table 3, Figure 4). Figure 4. The KOOS ADL subscale in 3 groups (n = 48) (Abbreviations: CKCE, Closed Kinetic Chain Exercise; TCE, Tai Chi Exercise). Sport and recreational activity subscale score in the TCE group was significantly more than CKCE and no exercise groups (F1,44 = 44.92, P = 0.004, P < 0.001; effect size, 0.67; respectively). Improvement in the CKCE group was significantly more than the no exercise group (P < 0.001). 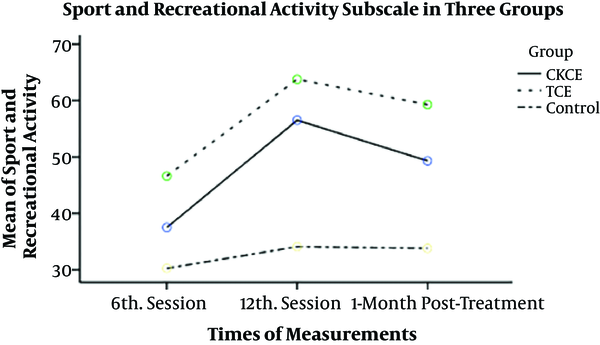 Sport and recreational activity subscale score at the times of measurements showed significant differences (F2,88 = 38.73, P < 0.001). The most significant improvement was seen during the twelfth session. The interaction effect of time* group was significant (F4,88= 13.36, P < 0.001). The most improvement was in the TCE group at the sixth session, twelfth session, and one-month post-treatment (Table 3, Figure 5). Figure 5. The KOOS sport and recreational activity subscale in 3 groups (n = 48) (Abbreviations: CKCE, Closed Kinetic Chain Exercise; TCE, Tai Chi Exercise). Quality of life subscale score in the TCE and CKCE groups was significantly more than the no exercise group (F1,44 = 5.14, P = 0.03, P = 0.01, effect size; 0.67). There was no significant difference between exercise groups (P = 1). 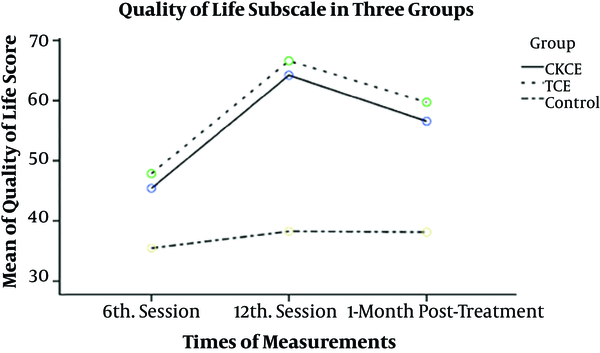 Quality of life subscale score at the times of measurements showed a significant difference (F2,88 = 90.81, P < 0.001). The most significant improvement was seen during the twelfth session. The interaction effect of time* group was significant (F4,88 = 14.41, P < 0.001). The most improvement was in the TCE group at the sixth session, twelfth session, and one-month post-treatment (Table 3, Figure 6). Figure 6. The KOOS QOL subscale in 3 groups (n = 48) (Abbreviations: CKCE, Closed Kinetic Chain Exercise; TCE, Tai Chi Exercise). Total score of the KOOS in the TCE group was significantly more than the CKCE and no exercise groups (F1,44 = 18.36, P = 0.002, P < 0.001; effect size,0.75). There was no significant difference between CKCE and no exercise groups (P = 0.07). 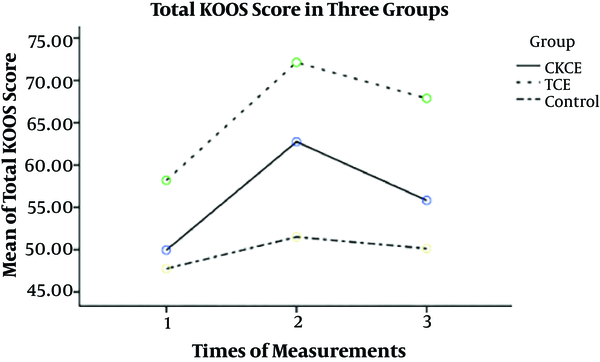 Total score of the KOOS at the times of measurements showed a significant difference (F2,88 = 312.42, P < 0.001). The greatest improvement was seen during the twelfth session. The total KOOS score from the first session to the twelfth session improved by 29.44 in the TCE group, 22.07 in the CKCE group, and 8.44 in the no exercise group. The interaction effect of time* group was significant (F4,88 = 34.77, P < 0.001). The greatest improvement was seen in the TCE group at the sixth session, twelfth session, and one-month post-treatment (Table 3, Figure 7). Figure 7. The total KOOS score in 3 groups (n = 48) (Abbreviations: CKCE, Closed Kinetic Chain Exercise; TCE, Tai Chi Exercise). In the present study, the effects of three types of treatment, TCE, CKCE, and routine physiotherapy on the six-minute walk test, and the KOOS subscales of pain, symptoms, ADL, QOL, and sport and recreational activity were investigated in patients with knee OA. To the best of the author’s knowledge, none of the previous studies had performed a comparative study of TCE, CKCE, and routine physiotherapy on patients with OA. 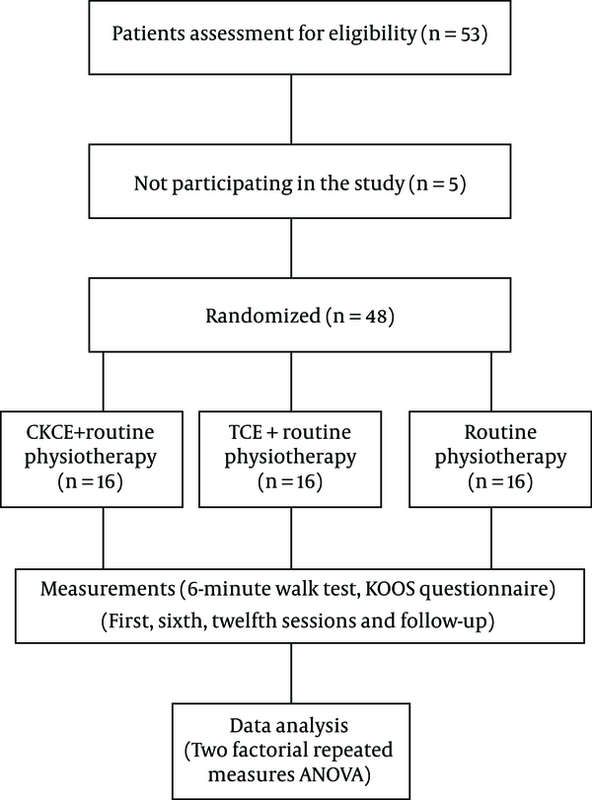 The results of the six-minute walk test showed that TCE and CKCE were both effective in improving patients walking distance; this may be related to several factors, such as an increase in circulation, pain reduction due to removing pain materials from the area, and a decrease of joint swelling. The results provide greater support for other studies. Wang et al. (2008, 2009) reported that at least 12 sessions of TCE were required to increase the ability to walk in six minutes (12, 18). Also, some studies confirmed the positive effects of CKCE on the speed and distance of walking in patients with knee OA (9, 19). One possible explanation is that proprioception sense of the knee joint is improved by increasing the joint internal pressure and thus stimulating the Ruffini nerve endings, leading to an increase in walking distance after exercise (9). In the present study, the researchers revealed that although the improvement of six-minute walk test was significant in all groups, the increase of mean distance was less than 70 meters, which is of less clinical importance (15). Considering the fact that the patients with knee OA had twelve treatment sessions in the present study, the finding can be claimed to be fairly reasonable. According to the results of the KOOS subscales, TCE was more effective than the CKCE and no exercise groups in reducing symptoms, pain, and improving ADL, sport, and recreational activity, and also the total KOOS score. However, both TCE and CKCE improved QOL more than the no exercise group. There are several possible explanations for the superiority of TCE over the other two approaches. Exercise could possibly have an essential effect on removing pain materials and metabolites from the area, and improves nutrition of the joint due to an increase in circulation; therefore, leads to pain reduction. Also, movements may increase joint lubrication and reduce swelling. The advantage of TCE to CKCE is that TCE is a meditation in movement and can help the patient concentrate on movement and increase the patient motivation. In this way, the effect of TCE may be more than CKCE on the reduction of pain in the patients. Some studies showed that TCE reduced joint pain (12, 20); Song et al. (2003) in their study on 43 elderly females with OA, showed that performing TCE decreased the OA symptoms and improved balance and physical function after 12 weeks (21). The decrease of pain and symptoms, and an increase of muscle strength and endurance due to performing exercise, have important effects on the improvement of walking speed, ADL, and QOL. Also, the other possible reasons for improving ADL and QOL are the positive effects of exercise on muscle spindle setting, recruitment of more motor units, stimulation of proprioception receptors in the joint capsule and pre-articular ligaments. All of these factors increase the awareness of patients from their joints positions and have a crucial role in improving ADL and QOL. Some of these explanations have also been reported in previous studies. It has been reported that TCE increased muscle strength, flexibility and balance (22, 23), and improved physical function in patients with knee OA (12). Hartman et al. (2000) and Chen et al. (2008) reported that performing TCE improved functional mobility and QOL in eldery people with lower limb OA (10, 24) although, they used two hours of exercise per week for twelve weeks, which was more than the time duration of performing exercises in the current study. During performing TCE, muscles act frequently as a stabilizer, mover, weight-bearer, non-weight-bearer, contractor and relaxer (25); therefore, this may improve muscle strength and reaction time, and leads to improvement of physical activity, ADL and QOL, and sports activities of patients with knee OA. It has been shown that TCE has positive effects on the psychological and physical function (26-28), and focuses on posture, breathing patterns, and meditation; and improves physiological and biochemical outcomes (29, 30). All of these factors may help patients participate in sport and recreational activities. Therefore, it seems that TCE could influence the improvement of patients with knee OA in several aspects. The current study showed that both exercise groups similarly improved the QOL in patients with knee OA. Shields et al. reported that in CKCE strengthening of quadriceps and facilitation of hamstrings co-activation occurred while using hip and ankle joints (31). Since exercise may increase joint mechanoreceptors stimulation, and muscle spindles firing rates increases joint reposition acuity. All of these factors affect the QOL in the patients with knee OA. Lou et al. (2017) in their study showed that performing TCE on softball improved QOL, dynamic balance, and leg strength of individuals aged older than 55 years (32). In the current study, the duration of performing TCE in each session (20 minutes) and the number of the treatment sessions (12 sessions) were less than similar studies (13, 20). The results of the current study showed that exercise was effective in relieving pain and improving functional abilities in patients with knee OA and this is a strong point of this study. It can be argued that the relief and improvement may be due to the combination of TCE and routine physiotherapy in the current study. This study did not have a long follow-up duration; this may be a weak point of the current study. Both TCE and CKCE relieved pain, improved the subscales of the KOOS questionnaire - symptoms, ADL, sport and recreational activity and increased six-minute walking distance in patients with knee QA; however, the effect of TCE was greater than that of CKCE. The effects of both exercises on the improvement of QOL were similar. The authors would like to acknowledge the patients, who participated in this study gratefully. 1. Ahmed AF. Effect of sensorimotor training on balance in elderly patients with knee osteoarthritis. J Adv Res. 2011;2(4):305-11. doi: 10.1016/j.jare.2011.02.001. 2. Michael JW, Schluter-Brust KU, Eysel P. The epidemiology, etiology, diagnosis, and treatment of osteoarthritis of the knee. Dtsch Arztebl Int. 2010;107(9):152-62. doi: 10.3238/arztebl.2010.0152. [PubMed: 20305774]. [PubMed Central: PMC2841860]. 3. Bennell KL, Hinman RS. A review of the clinical evidence for exercise in osteoarthritis of the hip and knee. J Sci Med Sport. 2011;14(1):4-9. doi: 10.1016/j.jsams.2010.08.002. [PubMed: 20851051]. 4. McCarthy CJ, Oldham JA. The effectiveness of exercise in the treatment of osteoarthritic knees: a critical review. Phys Ther Rev. 2013;4(4):241-50. doi: 10.1179/ptr.1999.4.4.241. 5. Reid DA, McNair PJ. Effects of an acute hamstring stretch in people with and without osteoarthritis of the knee. Physiotherapy. 2010;96(1):14-21. doi: 10.1016/j.physio.2009.06.010. [PubMed: 20113758]. 6. Khalkhali M, Ghasemi M, Talebian Z, Abouie M. [Effects of balance and closed and opened chain exercises on properioception error of knee in healthy females]. Res Med. 2004;28(2):115-9. Persian. 7. Jang KS, Kang S, Woo SH, Bae JY, Shin KO. Effects of combined open kinetic chain and closed kinetic chain training using pulley exercise machines on muscle strength and angiogenesis factors. J Phys Ther Sci. 2016;28(3):960-6. doi: 10.1589/jpts.28.960. [PubMed: 27134393]. [PubMed Central: PMC4842474]. 8. Alghadir A, Anwer S. Effect of retro and forward walking on quadriceps muscle strength, pain, function, and mobility in patients with knee osteoarthritis: a protocol for a randomized controlled trial. BMC Musculoskelet Disord. 2016;17:161. doi: 10.1186/s12891-016-1021-z. [PubMed: 27072798]. [PubMed Central: PMC4830006]. 9. Jan MH, Lin CH, Lin YF, Lin JJ, Lin DH. Effects of weight-bearing versus nonweight-bearing exercise on function, walking speed, and position sense in participants with knee osteoarthritis: a randomized controlled trial. Arch Phys Med Rehabil. 2009;90(6):897-904. doi: 10.1016/j.apmr.2008.11.018. [PubMed: 19480863]. 10. Chen CH, Yen M, Fetzer S, Lo LH, Lam P. The effects of tai chi exercise on elders with osteoarthritis: a longitudinal study. Asian Nurs Res (Korean Soc Nurs Sci). 2008;2(4):235-41. doi: 10.1016/S1976-1317(09)60005-0. [PubMed: 25029961]. 11. Kuramoto AM. Therapeutic benefits of Tai Chi exercise: research review. WMJ. 2006;105(7):42-6. [PubMed: 17163086]. 12. Wang C, Schmid CH, Hibberd PL, Kalish R, Roubenoff R, Rones R, et al. Tai Chi is effective in treating knee osteoarthritis: a randomized controlled trial. Arthritis Rheum. 2009;61(11):1545-53. doi: 10.1002/art.24832. [PubMed: 19877092]. [PubMed Central: PMC3023169]. 13. Wang C, Schmid CH, Iversen MD, Harvey WF, Fielding RA, Driban JB, et al. Comparative Effectiveness of Tai Chi Versus Physical Therapy for Knee Osteoarthritis: A Randomized Trial. Ann Intern Med. 2016;165(2):77-86. doi: 10.7326/M15-2143. [PubMed: 27183035]. [PubMed Central: PMC4960454]. 14. Saraei-Pour S, Salavati M, Akhbari B, Kazem-Nezhad A. Translation and adaptation of knee injury and osteoarthritis outcome score (koos) in to persian and testing persian version reliability among Iranians with osteoarthritis. Arch Rehabil. 2007;8(1):42-6. 15. Enright PL. The six-minute walk test. Respir Care. 2003;48(8):783-5. [PubMed: 12890299]. 16. Hughes SL, Seymour RB, Campbell R, Pollak N, Huber G, Sharma L. Impact of the fit and strong intervention on older adults with osteoarthritis. Gerontologist. 2004;44(2):217-28. doi: 10.1093/geront/44.2.217. [PubMed: 15075418]. 17. Stratford PW, Kennedy DM, Woodhouse LJ. Performance measures provide assessments of pain and function in people with advanced osteoarthritis of the hip or knee. Phys Ther. 2006;86(11):1489-96. doi: 10.2522/ptj.20060002. [PubMed: 17079748]. 18. Wang C, Schmid CH, Hibberd PL, Kalish R, Roubenoff R, Rones R, et al. Tai Chi for treating knee osteoarthritis: designing a long-term follow up randomized controlled trial. BMC Musculoskelet Disord. 2008;9:108. doi: 10.1186/1471-2474-9-108. [PubMed: 18664276]. [PubMed Central: PMC2529300]. 19. Lim B. A comparative study of open and closed kinetic chain exercise regimes in patients with knee osteoarthritis. Physiother Singapore. 2002;5:34-40. 20. Lauche R, Langhorst J, Dobos G, Cramer H. A systematic review and meta-analysis of Tai Chi for osteoarthritis of the knee. Complement Ther Med. 2013;21(4):396-406. doi: 10.1016/j.ctim.2013.06.001. [PubMed: 23876571]. 21. Song R, Lee EO, Lam P, Bae SC. Effects of tai chi exercise on pain, balance, muscle strength, and perceived difficulties in physical functioning in older women with osteoarthritis: a randomized clinical trial. J Rheumatol. 2003;30(9):2039-44. [PubMed: 12966613]. 22. Christou EA, Yang Y, Rosengren KS. Taiji training improves knee extensor strength and force control in older adults. J Gerontol A Biol Sci Med Sci. 2003;58(8):763-6. doi: 10.1093/gerona/58.8.M763. [PubMed: 12902537]. 23. Li F, Harmer P, Fisher KJ, McAuley E, Chaumeton N, Eckstrom E, et al. Tai Chi and fall reductions in older adults: a randomized controlled trial. J Gerontol A Biol Sci Med Sci. 2005;60(2):187-94. doi: 10.1093/gerona/60.2.187. [PubMed: 15814861]. 24. Hartman CA, Manos TM, Winter C, Hartman DM, Li B, Smith JC. Effects of T'ai Chi training on function and quality of life indicators in older adults with osteoarthritis. J Am Geriatr Soc. 2000;48(12):1553-9. doi: 10.1111/j.1532-5415.2000.tb03863.x. [PubMed: 11129742]. 25. Li JX, Xu DQ, Hong Y. Changes in muscle strength, endurance, and reaction of the lower extremities with Tai Chi intervention. J Biomech. 2009;42(8):967-71. doi: 10.1016/j.jbiomech.2009.03.001. [PubMed: 19356761]. 26. Verhagen AP, Immink M, van der Meulen A, Bierma-Zeinstra SM. The efficacy of Tai Chi Chuan in older adults: a systematic review. Fam Pract. 2004;21(1):107-13. doi: 10.1093/fampra/cmh122. [PubMed: 14760055]. 27. Wang C, Collet JP, Lau J. The effect of Tai Chi on health outcomes in patients with chronic conditions: a systematic review. Arch Intern Med. 2004;164(5):493-501. doi: 10.1001/archinte.164.5.493. [PubMed: 15006825]. 28. Wolf SL, Barnhart HX, Kutner NG, McNeely E, Coogler C, Xu T. Reducing frailty and falls in older persons: an investigation of Tai Chi and computerized balance training. Atlanta FICSIT Group. Frailty and Injuries: Cooperative Studies of Intervention Techniques. J Am Geriatr Soc. 1996;44(5):489-97. doi: 10.1111/j.1532-5415.1996.tb01432.x. [PubMed: 8617895]. 29. Wang XQ, Pi YL, Chen PJ, Liu Y, Wang R, Li X, et al. Traditional Chinese Exercise for Cardiovascular Diseases: Systematic Review and Meta-Analysis of Randomized Controlled Trials. J Am Heart Assoc. 2016;5(3). e002562. doi: 10.1161/JAHA.115.002562. [PubMed: 26961239]. [PubMed Central: PMC4943241]. 30. Jahnke R, Larkey L, Rogers C, Etnier J, Lin F. A comprehensive review of health benefits of qigong and tai chi. Am J Health Promot. 2010;24(6):e1-e25. doi: 10.4278/ajhp.081013-LIT-248. [PubMed: 20594090]. [PubMed Central: PMC3085832]. 31. Shields RK, Madhavan S, Gregg E, Leitch J, Petersen B, Salata S, et al. Neuromuscular control of the knee during a resisted single-limb squat exercise. Am J Sports Med. 2005;33(10):1520-6. doi: 10.1177/0363546504274150. [PubMed: 16009991]. [PubMed Central: PMC4042320]. 32. Lou L, Zou L, Fang Q, Wang H, Liu Y, Tian Z, et al. Effect of Taichi Softball on Function-Related Outcomes in Older Adults: A Randomized Control Trial. Evid Based Complement Alternat Med. 2017;2017:4585424. doi: 10.1155/2017/4585424. [PubMed: 28484505]. [PubMed Central: PMC5397616].